Last Mother's Day, my kids gave me the best gift — a stack of cooking magazines. My favorite was Curbside Cuisine, with its pages of recipes from the country's greatest food trucks, with an emphasis on burgers and tacos. 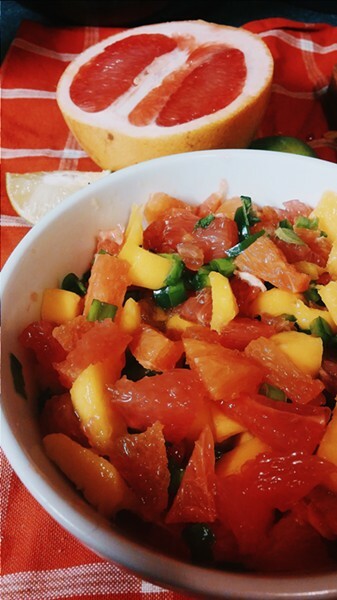 We've made and devoured many of the recipes we found in those pages, but the one we've really adopted as our own is this citrus salsa. We make tacos every week at my house and I'm always looking for new and exciting fillings to change things up. This salsa has been in taco-night rotation since the first time we tried it. It's the perfect recipe for making the most of winter citrus fruit and it also works wonderfully with chicken, fish, and (our current favorite) roasted veggies like cauliflower, carrots and butternut squash. It's also great tossed with greens and a little olive oil, served over rice or couscous, or as a snack with tortilla chips. *I'm the only one in my family who likes cilantro, so I just chop some for myself and add it to my own tacos. If you have no cilantro haters at your house I urge you to add it to the salsa. Combine all ingredients in a medium bowl and toss. Taste and adjust salt and/or lemon and lime juice if necessary. The salsa will keep in the refrigerator for a day or two if tightly covered.